With its smooth, clean style the Gazco Vogue Midi gas stove effortlessly fits into either traditional and modern contemporary settings. 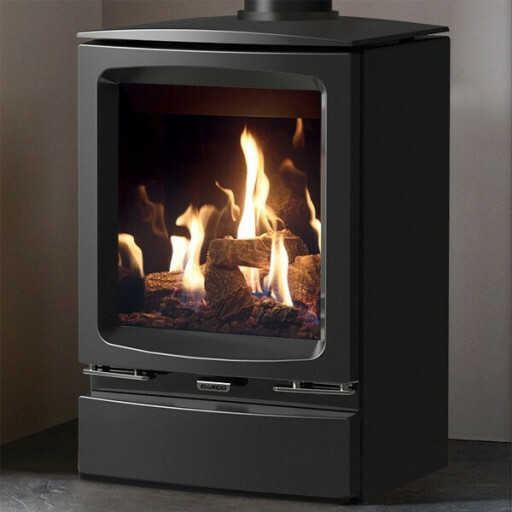 Featuring a steel body, cast iron door and top plate coupled with a highly realistic fuel bed and polished EchoFlame black glass lining will provide you with a stunning view of the flames and state of the art innovative technology providing you with upto 4.7kW output and efficiency values of 76% (90.6% on the balanced flue model). It comes as standard with manual controls behind the base, an added advantage is the upgradeable remote control and thermostatic remote control allowing you to preset the stove to provide you with the heat at selected times, days and specified temperature.